The technology combines body-mounted miniaturized jet-engines with a specially-designed exoskeletal suit – reminiscent of the type used by Marvel superhero ‘Iron Man’, portrayed by Robert Downey Jr in the recent Hollywood blockbusters. Propulsion for Browning’s invention comes from six miniature jet engines, similar to those found in high-end model aircraft, which are mounted on the arms and lower back. Browning, 38, a former Royal Marine reservist, developed the suit in his garage in Salisbury over the past 10 months. He has named it after the Greek mythological figure Daedalus. 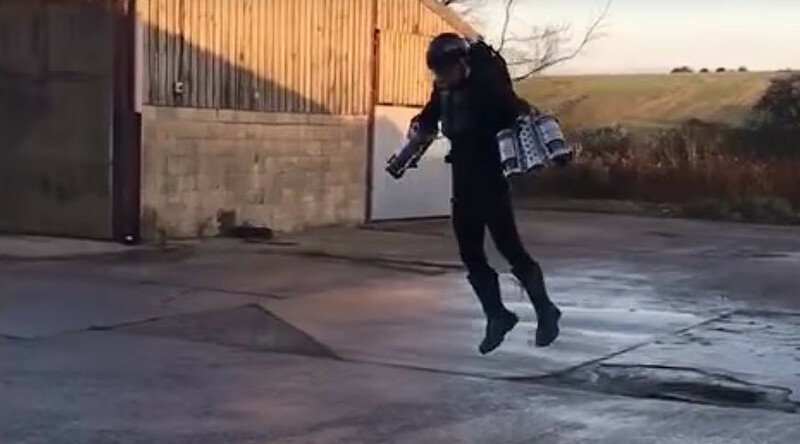 The entrepreneur has released a YouTube video showing him testing the suit in fields, factories and empty car parks. He says the suit can fly in most locations, and despite being capable of flying at several hundred miles per hour at thousands of feet, normal operation of the suit sees the wearer flying at no more than a couple of metres. “This is a momentous point in aviation history,” Browning told the Daily Mail. “Daedalus is simply the beginning of a core technology that has endless potential in aviation, commercial and entertainment applications. “We are serious about building a world-changing technology business. We stand at the very beginning of what human propulsion systems will do,” he added.